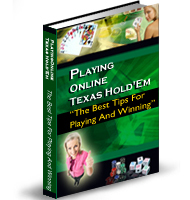 Online Poker is a lot easier to learn than doing so in a real poker room. Sure, both would have the same rules and probably the same tricks, the same use of cards, and the same use of the chips. However, nothing beats enjoying this very popular gambling game using ones own computer, in the comforts of ones own home. Playing poker online is almost the same as playing it in a land-based poker room. Only, its easier! To play the game, one needs to be very familiar with the poker hand rankings. These are different card combinations that determine your hand strength. The hand strength can determine how players apply their betting techniques. The game starts when all seated players have received two cards and the players in the small blind and big blind have already placed their compulsory bets, these bets are called blinds. Following a pre-flop round of betting, three community cards will be shown on the table. These are cards that all players can share and is known as the Flop. After the flop is dealt a second round of betting begins. This betting round is followed by a fourth card (called the turn) and fifth card (called the river) that shall be dealt along with the flop. Following each card being dealt, a round of betting will commence. After the river is revealed, and there is no more betting to take place, a showdown of cards is done and the strongest hand wins the pot. In the event where all the other players folded but one, that one remaining player wins the pot. Generally, poker games come in two different types: Tournaments, and Cash Games. Cash games are where players can join any time a seat is available. Here, players must sit with a minimum amount of real money, up to the maximum amount, which is set by the stakes being played. Tournaments normally have a specified Buy In amount which is exchanged for a set amount of chips. This is to ensure that all players start off in equal footing, having the same starting stack. It is this easy in online pokerthe player just has to click his luck away to win! To try this, the number one online poker site in Asia allows first time players to play this very exciting game for free! Simply go to DafaPoker.com , register an account, download the online poker game, and start playing! JR Yu is a blogger and writer for online poker betting. Find out more details about the site here. To read more, click this.